In case you missed it, this is from FanHouse. I know my grammar isn't proper in the headline. Don't care. I have been reading about the possibilities of a Brock Lesnar vs. Undertaker match at Wrestlemania 27 for a couple of months now. I've avoided the topic, but there's been more buzz in recent days on some of the sites I read, so I thought I'd weigh in now. Maybe I'm in the minority but I don't want to see this happen. I'm happy for Brock and all the success he has had in the UFC, but I really think he kinda screwed over the WWE and its fans a few years ago. Maybe screwed over is too harsh. But I didn't care much for the way he left the WWE back in 2004. Although being on the receiving end of a Stone Cold Stunner was pretty good. Here's my problem with Brock. I don't like the way he left. The company spent a couple of years building him up to be a major player. He was fast tracked to the top. And why not? He fit the mold that Vince likes to fill. He's a big man who could work and get a decent reaction from the crowd. 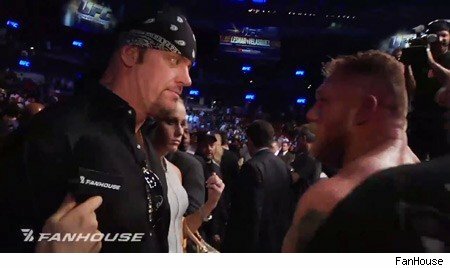 Now the buzz is that Brock will appear at Mania and end the Undertaker's streak because they had some sort of "confrontation" back in October at a UFC event. From all the reports I've read, Dana White is not budging on the issue of letting Lesnar wrestle. And why would Brock risk it? Would the WWE really have him as the man to end the streak? Surely not. At least I would hope not. If and when the streak ends, it needs to be done by a full time WWE superstar. That honor should be reserved for someone special. So if Brock doesn't end the streak, what would be the point of one of UFC's finest getting beat on such a grand stage? And if it happened, they'd be all kinds of media coverage. Probably not what the company is looking for, I'm suspecting. If it's not Brock coming to Wrestlemania, what WWE outsider should it be? There's also been talk of Kevin Nash, (ummm, no thanks) and even Shawn Michaels, which makes little sense. Also, does the WWE need an outsider coming in to Wrestlemania? It usually creates a little extra buzz, but probably not worth alienating your fan base, right?